Yesterday, January 28, 2015, a Hezbollah unit fired a Russian-made Kornet anti-tank missile at an Israeli convoy in the Har Dov region on the Israeli-side of the border with Lebanon killing a junior officer and his NCO. Surprisingly, the three ‘military’ vehicles were in fact regular-model vehicles being used by the military (the two soldiers killed were riding an Isuzu D-Max). Altogether, six Kornet missiles were fired by a small group of Hezbollah fighters lying in wait on the Lebanese side of the border with one striking a house in Ghajar. After the first missile struck the first vehicle killing both soldiers, the two other vehicles ground to a halt and all occupants jumped out and began returning fire as they ran for cover away from the vehicles that were subsequently destroyed by missiles. The Defense Minister was left trying to explain why not one, but three regular ‘white’ vehicles (the army unofficially classes vehicles as being either ‘white’ or ‘green’, where white vehicles are for civilian-like uses such as logistics, transport, policing and green vehicles are strictly military vehicles such as Humvees, tanks or APCs) were driving along the Lebanese border at such a tense time. Defense Minister Ya’alon used outright sophistry when he responded that ‘even a fortified vehicle would not have helped protect the soldiers’. While it is true that the vehicle would have sustained significant damage, it is not certain that the occupants would have died. Moreover, a limited number of armored Humvees are now be equipped with the Israeli designed and fielded Trophy system that destroys anti-tank missiles before striking the vehicle. So why were these vehicles struck? The vehicles were not really that close to the border as many had assumed. In fact, they were at least 3 kilometers away from the border and 4 kilometers from the Hezbollah fighters. The vehicles were travelling on a regular road open normally to civilian traffic but because of the tensions up north, there was a roadblock at which the army vehicles had to stop. Apparently, the Hezbollah fighters were waiting for an appropriate target (a stationary ‘white’ military vehicle fit the bill). However, what Defense Minister Ya’alon might have said was: ‘it’s impracticable to close a 4 kilometer strip from the Lebanese border to only armored vehicles, especially in light of the fact that there are many communities within that area’. And he would have been right. 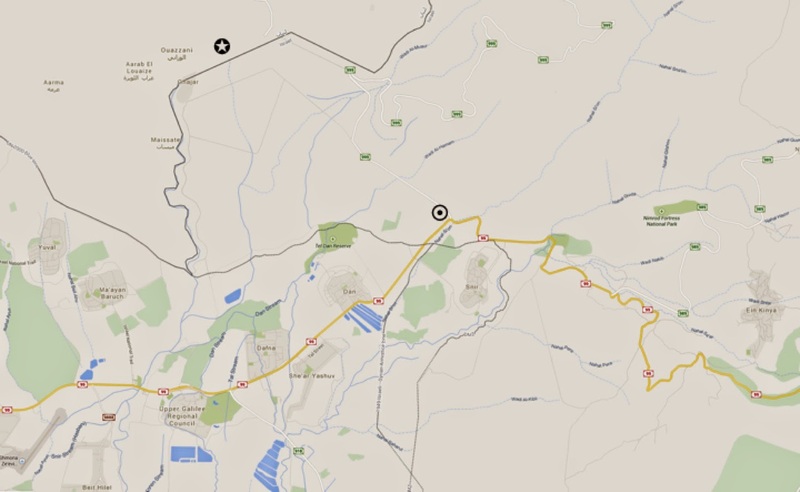 On the map below the star represents where the Hezbollah missiles were fired and the black dot is the targeted Israeli convoy. Note the black Lebanese borderline in the upper left hand corner. Mainstream news is replete with stories how Hezbollah has signaled through the UN that it has got its pound of flesh for last week’s strike on its people and that even the Israelis are looking to calm things down lest we find ourselves in another Lebanon war. I believe that things will get worse before they get better. While it is clear that Iran and its Lebanese proxy Hezbollah have no interest in a large confrontation with a militarily superior Israel due to its commitments in Syria where considerable numbers of Hezbollah fighters, maybe three quarters of its operational force are actively fighting in Syria trying to prop up the Assad regime – and indeed turning the tide in its favor, Israel is dealing with a new challenge and change to the status quo which is likely to bring about further confrontation with Hezbollah and Iran within the Syrian sector. Israel has watched with trepidation as Syrian rebel groups, including the Al Nusra Front (an Al Qaeda offshoot), have pushed Syrian soldiers out of the Israel-Syrian side of its border. The Syrian-Israeli border has been the most peaceful border that Israel has shared with any Arab country for the past few decades, despite the fact that both countries are technically still in a state of war. Why? Because Assad senior and later Assad junior have taken pains to keep the border quiet and heavily mined. This has worked well for both parties, but with Assad junior loosing his grip on power, Syrian rebel groups have taken the area over and have also maintained a policy of non-confrontation. Imagine that. A zealously religious Sunni Arab group aligned with Al Qaeda is a stone’s throw away from the Jewish infidels and nary a stray bullet is to be seen. Odd? No. Machiavellian, yes. Al Nusra have bigger fish to fry for now and are wholly focused on defeating the Assad regime together with other Syrian rebel groups who are their ideological antithesis (in fact the secular Free Syrian Army has been working with the Al Nusra Front in the Quneitra area). The Israelis are watching developments there with natural unease, but what has really alarmed the Israelis has been the arrival of large numbers of Hezbollah fighters fighting on the side of the Syrian regime together with IRGC assistance and forces against the predominantly Sunni-led rebel forces. To be frank, Israel would have preferred a stable Assad regime over sectarian rebel groups with their own parochial agendas, yet the thought of an Iranian proxy force unfettered by the powers that be in Lebanon is a nightmare scenario for the Israeli government. While Shite Hezbollah is a strong Lebanese political party with a significant military presence in Lebanon it is forced to share power with a large and more liberal Sunni faction and smaller Druze and Christian parties as well. A weak Assad regime with a strong Hezbollah force controlling the Syrian border with Israel would be under no such constraints and would be able to act more confidently against Israel then presently allowed under Lebanon. In essence, Iran would for the first time share a border with Israel and would be able to act with more freedom vis-à-vis Israel as well as other moderate Arab regimes. Israel will stop at nothing to keep this nightmare scenario from reaching fruition. Gen. Qasim Soleimani’s presence in Syria and Lebanon most probably involved the strengthening of Hezbollah’s grasp in Syria and particularly in western and southern Syria, those areas bordering Lebanon and Israel. As such, since Hezbollah and Iran are pushing forward towards strengthening their role in Syria they are on a collision course with Israeli policy of keeping Iran at bay, preserving a neutral Syrian border and maintaining its regional balance of power in its local backyard. If war should ever breakout in the area again, Israel would in a more precarious position in light of a dominant and independent Iranian/Hezbollah presence in Syria. Israel will act to redress the change in the balance of power. It may not result in any immediate action but I'm sure the Israeli Ministry of Defense is drawing up appropriate plans to ensure that Hezbollah does not get the upper hand in Syria. One of the key elements of such plan would undoubtedly be striking Hezbollah strongholds in Syria.